If that sounds familiar, I’m hoping you’ll change your mind by the time you finish reading this post. To start, think of the last time you heard a song you loved, but you didn’t know the singer or band performing it. It could be music that plays during a television show or the closing credits of a movie. It could make your ears perk up when you’re switching radio stations in your car. Find out who performs this song. The same idea can be applied to your content. The first time someone reads, listens, or views your content, they should feel curious about you. Generic content doesn’t stimulate curiosity. But before you can uncover and harness the qualities that make you special, you have to start with something. In the music example above, the artist had already produced other work for you to explore. They were putting in the time, experimenting, failing, and trying again … long before you had ever heard of them. They were building their body of work so that they had more to offer you once you did finally discover them. 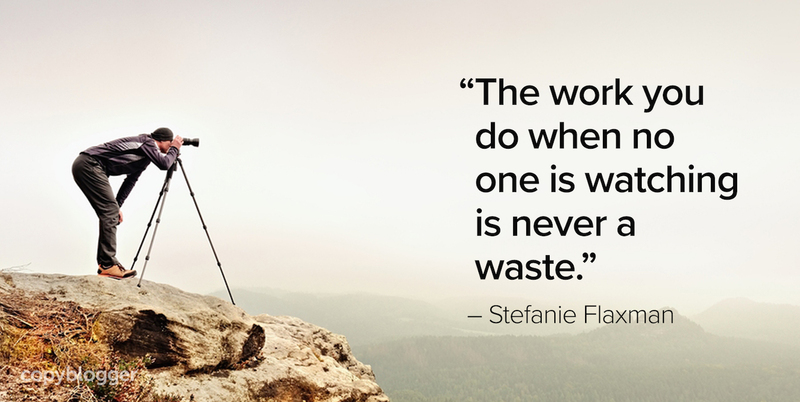 The work you do when no one is watching is never a waste. Even though you’ll probably be more reserved about what you reveal when you first start out, that early content is still an important part of your evolution. Once you get comfortable publishing, you’ll learn to add the remarkable details that form connections with your audience members. It could be your search for the perfect gluten-free cupcakes or a silly play on song lyrics — meaningful and fascinating angles that persuade someone to subscribe to your content. Similarly, if every other content marketer in your niche quits tomorrow, you’re not automatically going to win more clients and customers. If you don’t present the right kind of value to the people you want to attract, that scenario doesn’t give you any advantage. You have limitless ways to do that — there’s a new opportunity every time you publish. Your most recent piece of content should be your only competition. A great refresher for why we do what we do! It’s so easy to get bogged down in looking around at what others are doing, we lose focus on what we’re really wanting to accomplish with our own content. Excellent reminder of what’s important! Thanks for sharing! Thanks for sharing your article Stephanie. As a newbie to the world of copy blogger, and indeed content creation, discovering and reading work published by people such as you is really helpful in building my confidence.